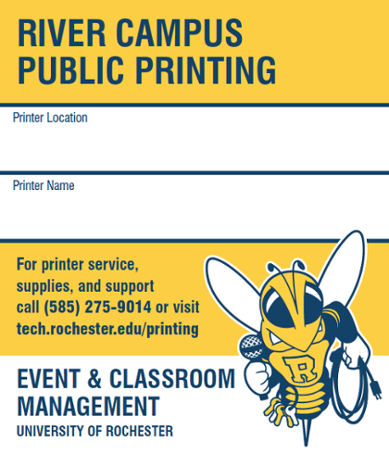 Event and Classroom Management (ECM) acts as your first level of support for public printing in classrooms, labs and libraries on River Campus. For more information about how public printing works, including FAQs, rates, locations, queues and tutorials, please visit IT's printing page. If you are experiencing an issue with the pay-for-print system please call the help desk at 585-275-2000, or enter a ticket directly using the online service request. After logging onto the online service requests select the pay-for-print request form. Non-pay-for-print devices on the River Campus- contact the main Information Technology helpdesk at 585-275-2000 or your departmental desktop support staff directly.